Welcome to the Solveering Web Site. 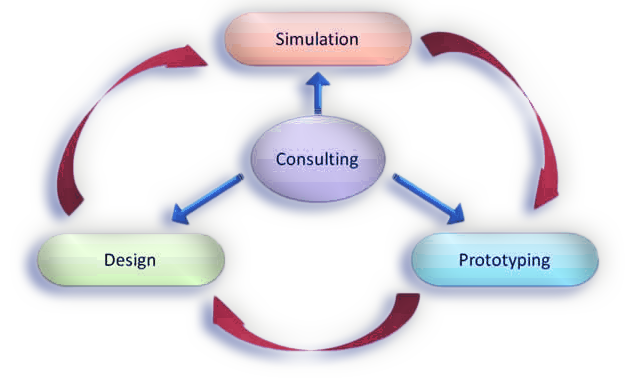 At Solveering LLC, our main focus is on providing services related to Development, Simulation and Implementation of your ideas. The image to the left shows what services we provide and how they interact This is our main hub for information relating to services, capabilities and contact info. Here you will see links to information on each of our departments and areas of focus. Please follow any of these links or the navigation bar at the top of the page. Our core capability is Fluid-Thermal (CFD) simulation. We can perform a range of different simulation types. Our in-house prototyping capabilities are tailored to simpler parts for test fitting or functional verification. Please use our online form to contact us regarding any requests, estimates or general inquiries and support.